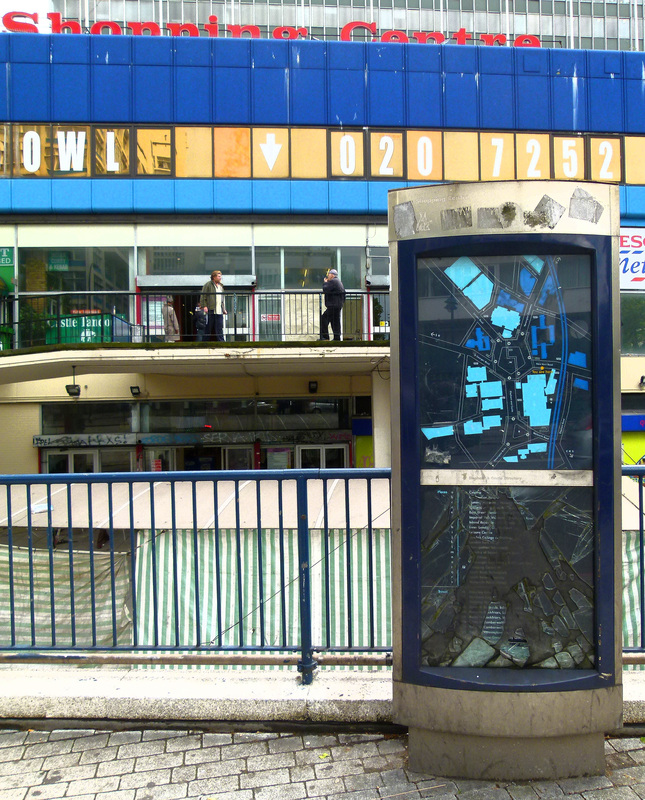 Being a major transport hub with a large civilian population, the Elephant and Castle was bombed heavily during World War Two. 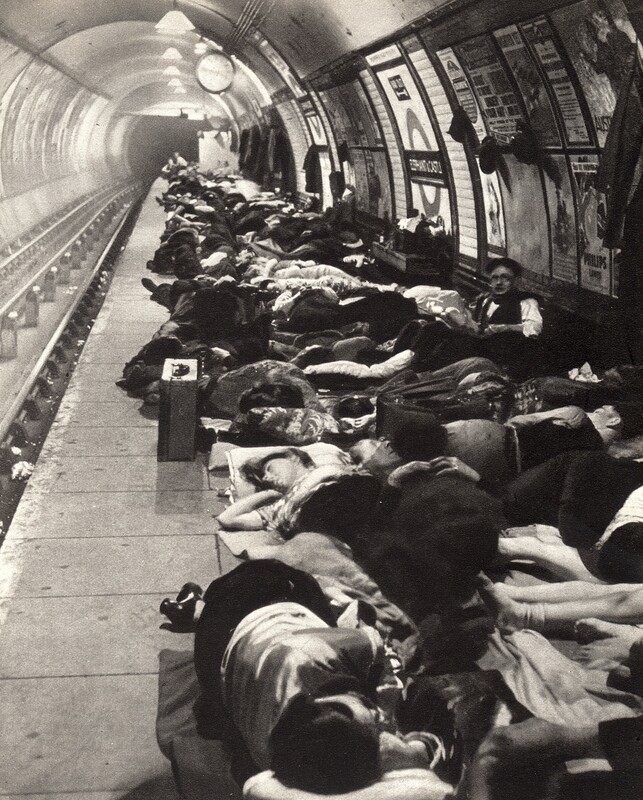 Londoners sheltering at Elephant and Castle tube station during the Blitz. The worst raid to hit the area took place on the 10th May 1941, when bombers deliberately targeted the south London district in order to create a ferocious firestorm which rapidly engulfed the Elephant. 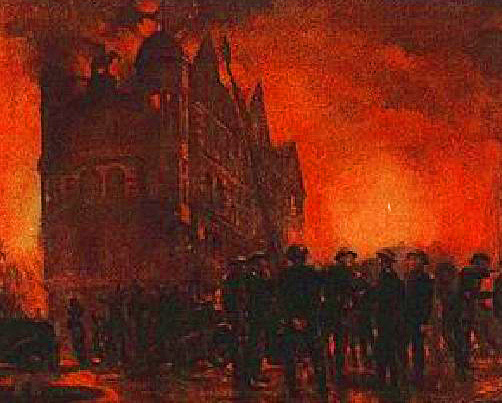 A painting depicting the night in which the Elephant was consumed by flames. After the war much of the Elephant lay in ruins, a shadow of its pre-war days when Londoners had flocked there to indulge in its many shops and places of entertainment. 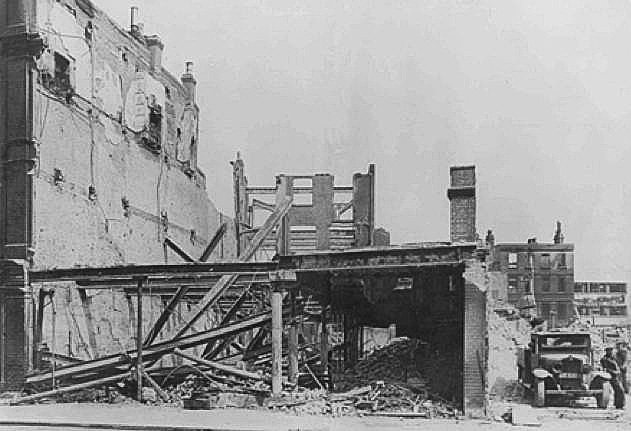 Bomb damage at the Elephant, 1941. The destroyed building had been a branch of ‘Woolworths’. For over a decade, the Elephant remained pretty much in tatters, pitted by numerous bomb craters which provided exciting playgrounds for local kids. In March 1958, the down-at-heel area received a welcome dash of American glamour when rock and roll star, Buddy Holly played to a huge audience at the Elephant and Castle’s Trocadero. 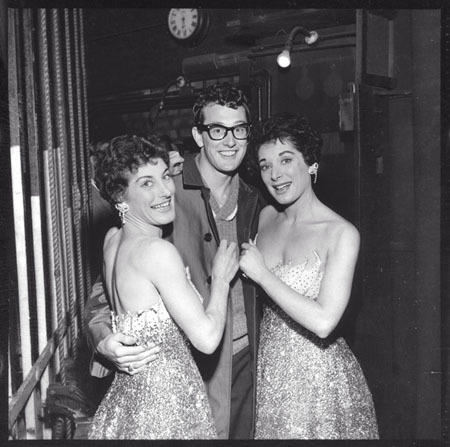 To read more about Buddy Holly’s time in London, please click here. 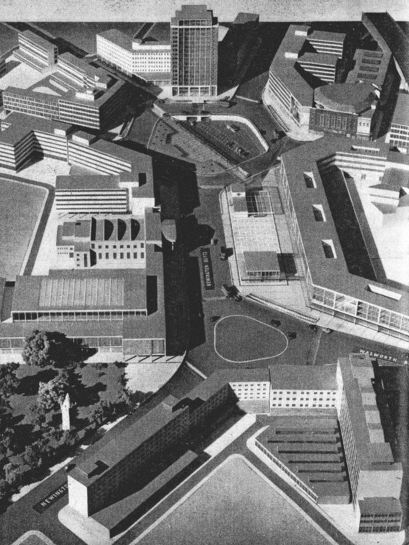 Meanwhile, behind the scenes, town planners were hard at work, drawing up plans for a massive redevelopment of the area… for Elephant and Castle was about to become a huge canvas for some of London’s most prominent post-war architecture. The new road-layout was the first part of the scheme to be implemented, with two huge roundabouts stamped down during the 1950s. This prominent road system was highly representative of the mood of planners at the time, who envisioned a future in which the motor car would be king. Consequently, little thought was given to those who had to traverse the Elephant on foot and, to this day, pedestrians are forced to cross the area via a series of gloomy, narrow subways. 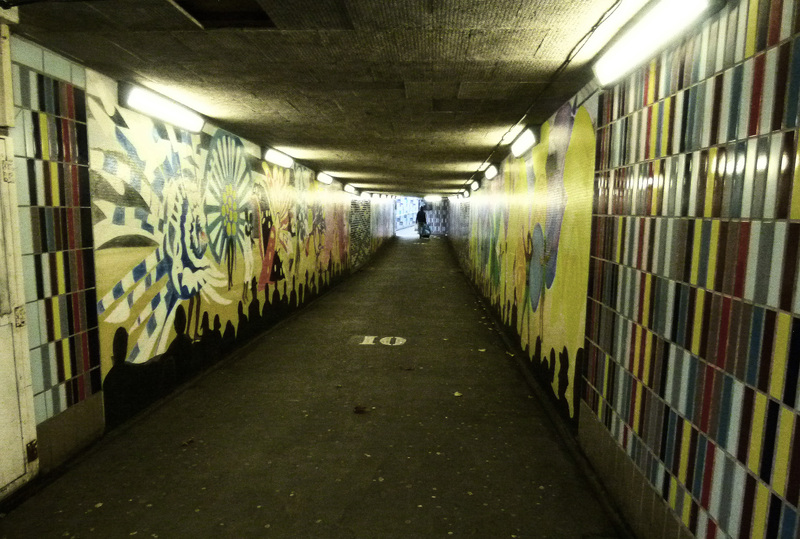 Subway beneath the Elephant’s northern roundabout. 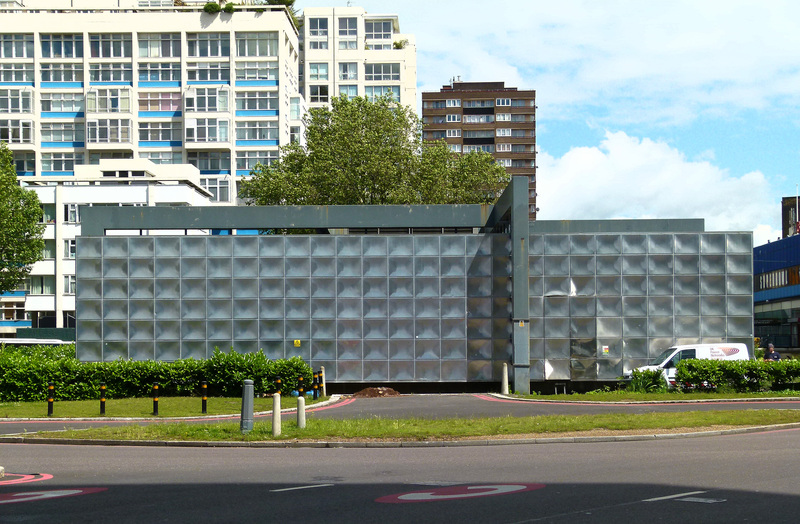 The very first building to be completed at the new Elephant was the Faraday Memorial; an avant-garde electricity sub-station, clad in stainless steel and plonked in the middle of the northern roundabout. Unveiled in 1961 as a taste of things to come, the Faraday Memorial can still be seen in its original location, un-disturbed by the many millions of vehicles which have roared around it during the past fifty years. The Faraday Memorial, overlooking the northern roundabout. 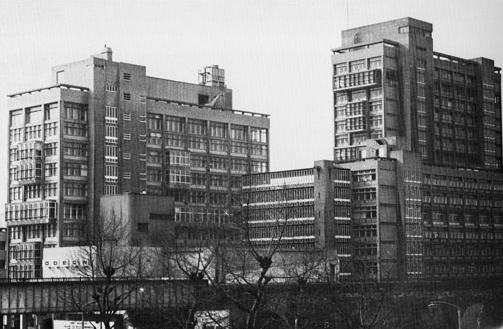 Next to pop up was Alexander Fleming House which opened in 1963. The modern trio of towers was designed by Erno Goldfinger, the infamous architect noted for his bold, uncompromising buildings… and egotistically fierce temper! Erno Goldfinger, who was highly influential in London’s post-war architecture. 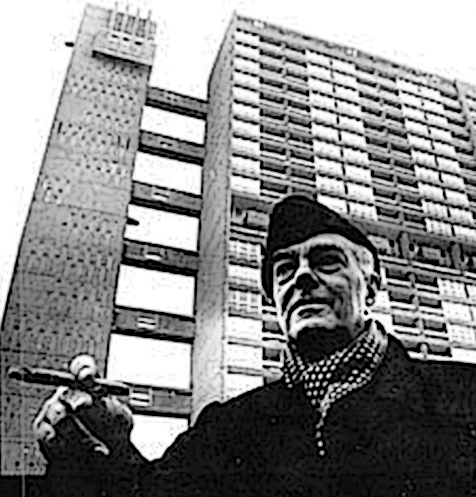 To find out more about the curmudgeonly Goldfinger, please click here for my earlier post on the ‘Trellick Tower’ which is widely regarded as his true masterpiece. 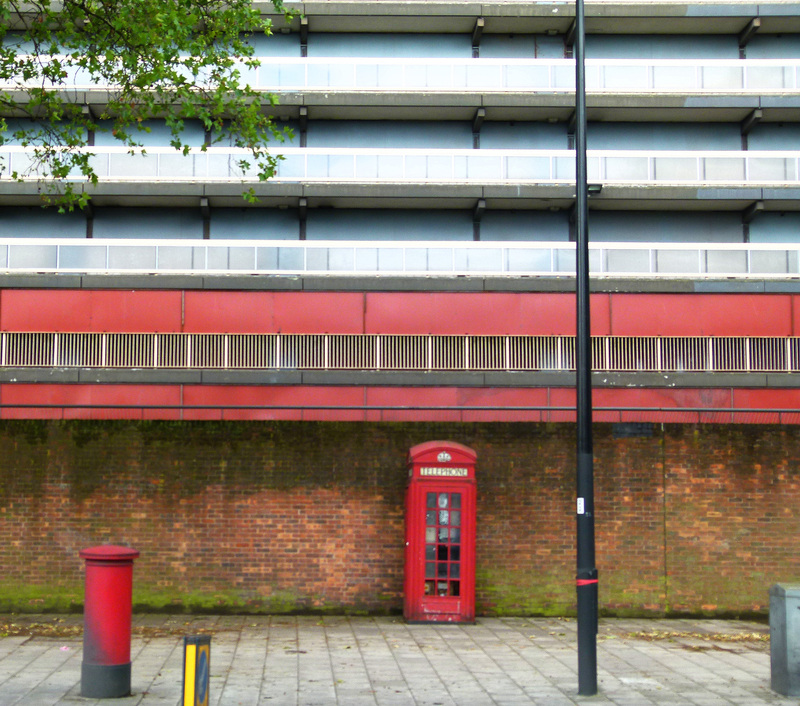 Goldfinger would go onto wield great influence over the Elephant and Castle. 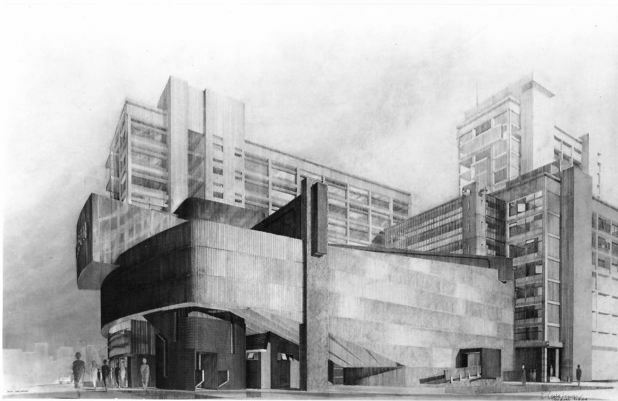 In 1966, he incorporated an Odeon cinema into Alexander Fleming House… which was rather fitting considering the complex was built on the site of the former Trocadero which had been demolished a few years after Buddy Holly’s celebrated visit. 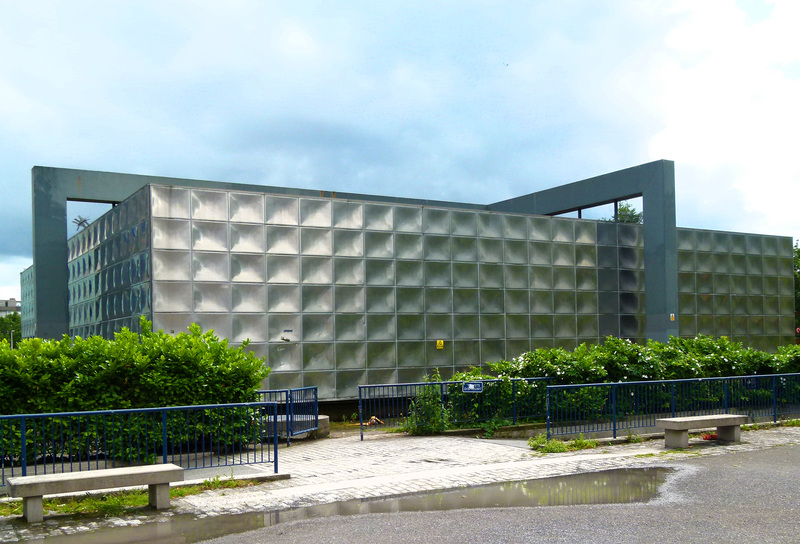 Designed in the Brutalist style, the modern Odeon contained seats for over 1,000 movie-goers. 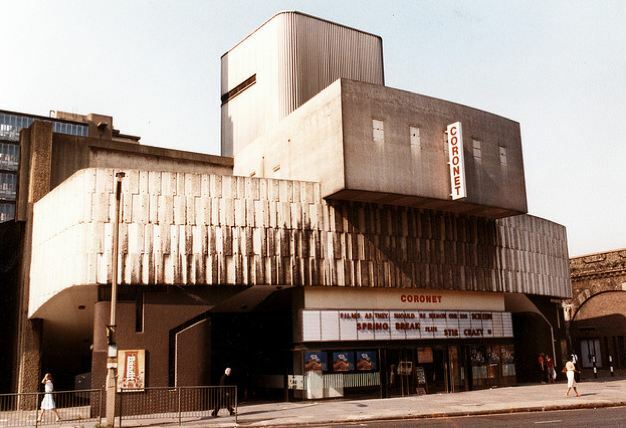 Sadly, the cinema was demolished in 1988 which is a real shame as, given current trends, I have a feeling it would have found a new lease of life as an independent picture-house had it been allowed to remain. 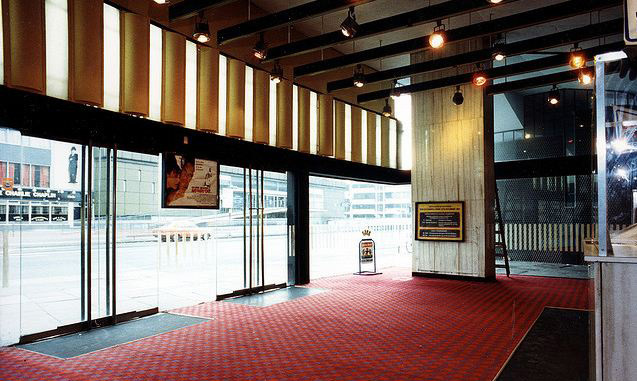 The Odeon’s foyer in 1988, shortly before demolition (many thanks to flickr user, dusashenka). 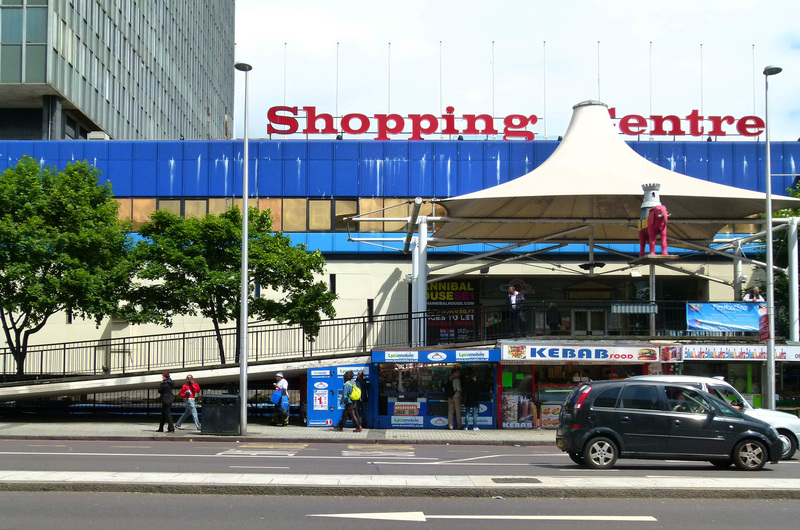 In 1965, yet another Goldfinger creation was unveiled in the area… the Elephant and Castle Shopping Centre. At the time, this new building was revolutionary; the first covered shopping complex in Europe. Locals however who, for generations had patronized traditional local shops and markets, were slow to embrace the new concept. 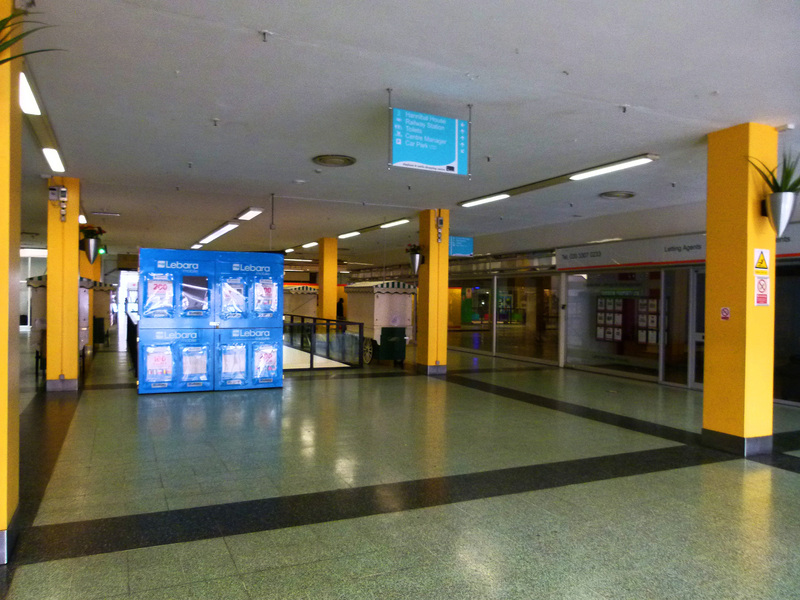 When the shopping centre first opened, trade was painfully slow with just 29 out of 120 shop units being occupied. Originally providing three floors for trade, it quickly became clear that this was one floor too many. 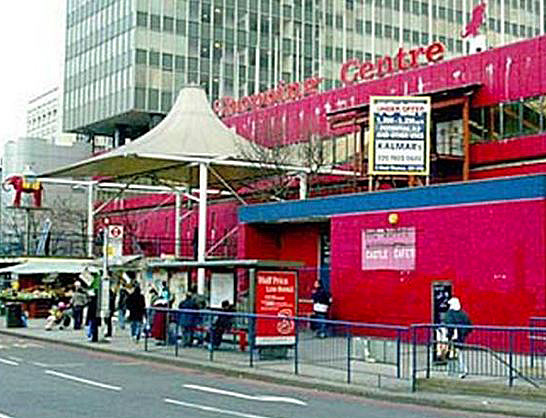 In 1990, the powers that be thought it would be a good idea to paint the Elephant and Castle shopping centre bright pink, a colour which remained on the building until very recently. I’ve often wondered what the idea behind this lurid scheme was. Not that I have anything against pink, but I was under the impression that a ‘pink elephant’ was something one only saw after a few to many sherries! 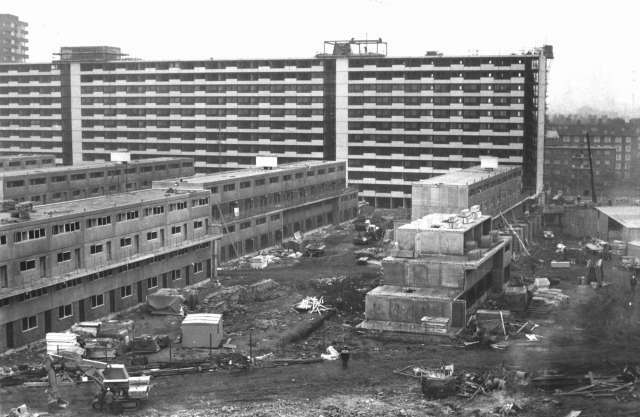 By far the largest post-war project to grace the Elephant and Castle was the vast Heygate Estate, which was completed in 1974 and provided homes for 3,000 people. Designed by Tim Tinker, the Heygate Estate was very much a product of its time; a huge housing scheme conjured on an incredibly ambitious scale, and designed with the best of intentions in mind. Aiming to make the estate an oasis of calm away from Elephant’s characteristic roar of traffic, Tim Tinker placed the tallest of the tower blocks around the perimeter, encircling and shielding smaller accommodation and areas of greenery within the middle. 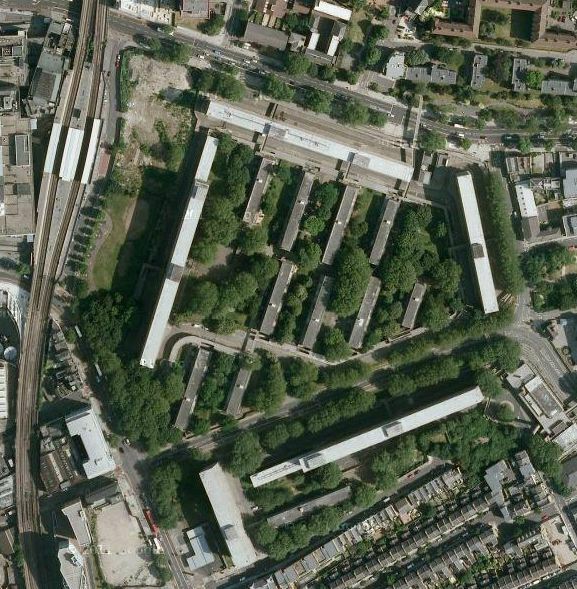 When viewed from above, it is indeed surprising just how much greenery the Heygate encompassed. However, as with many estates, the utopian ideal quickly became sour, with the modern innovations having quite the opposite effect of their intended purpose. The towering apartment slabs isolated their inhabitants, slicing off communities rather than drawing them together, whilst the windswept walkways and secluded communal areas provided fertile breeding ground for crime and anti-social behaviour. 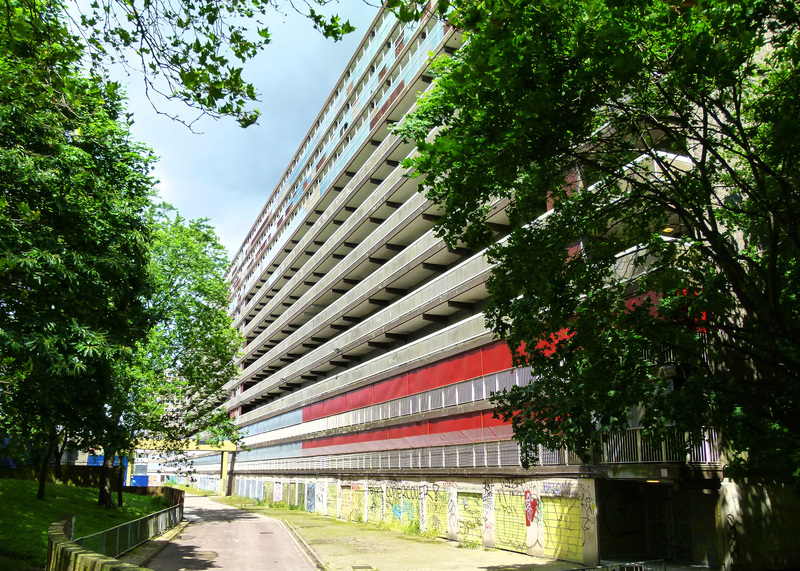 Unfortunately, unlike other examples of London Brutalist architecture- such as the Trellick Tower, National Theatre and Barbican Centre- the Heygate has received no revival and is currently undergoing demolition. Thanks to the large amounts of asbestos present, the destruction is a slow process, not expected to be completed until 2015. 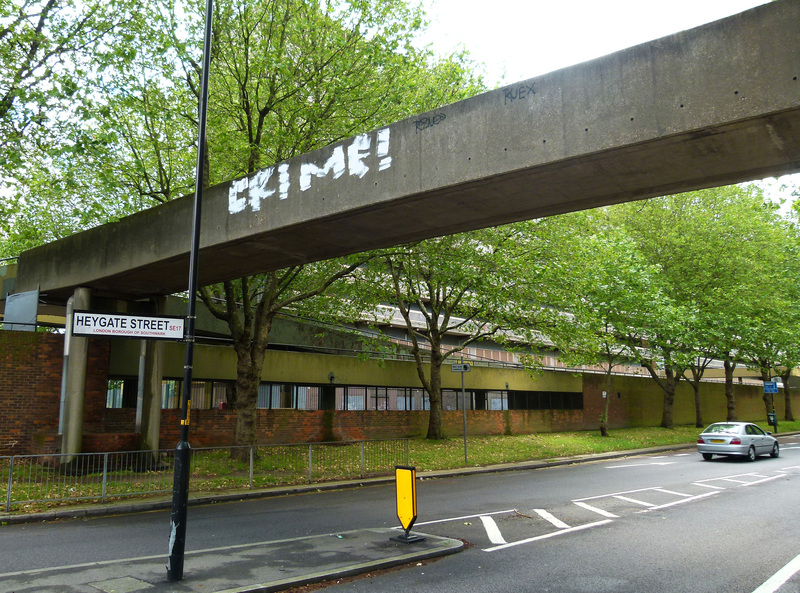 At present, the drawn out wrecking of the Heygate has made the old estate quite an atmospheric place; a vast, inner-city chunk of quiet decay, rather like something out of a post-apocalyptic film. 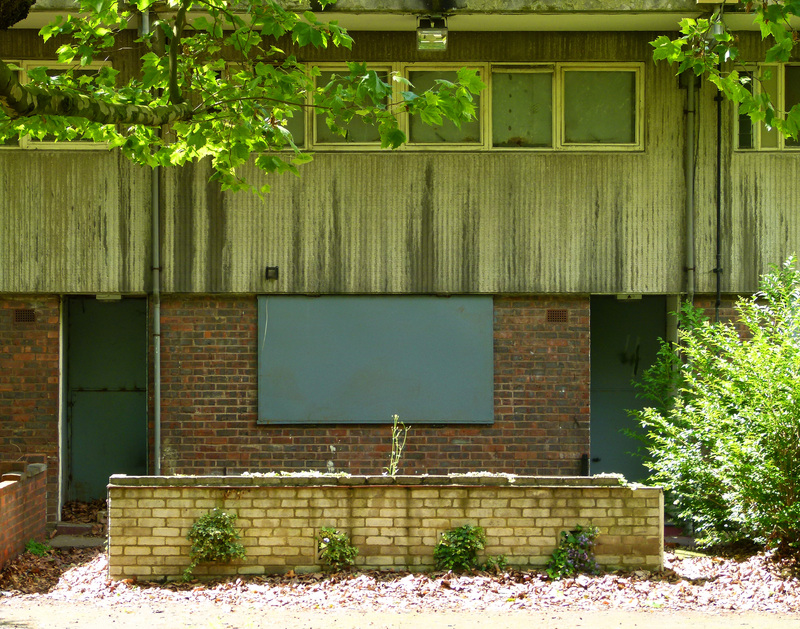 One of the Heygate’s low-rise homes… now in a rather sorry state. 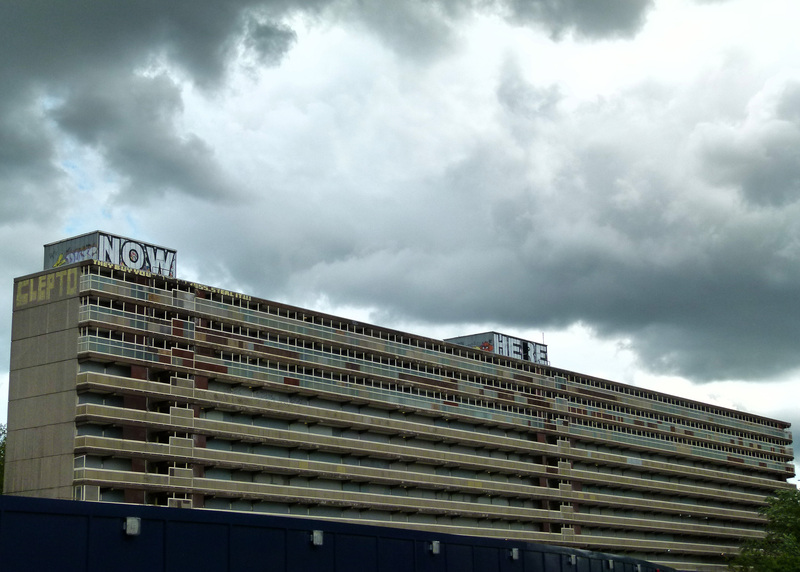 Despite being eerily deserted, at the time of writing, a tiny handful of residents are refusing to leave their homes on the Heygate in protest at Southwark council’s compulsory purchase order. Graffiti on the moss-ridden garages. 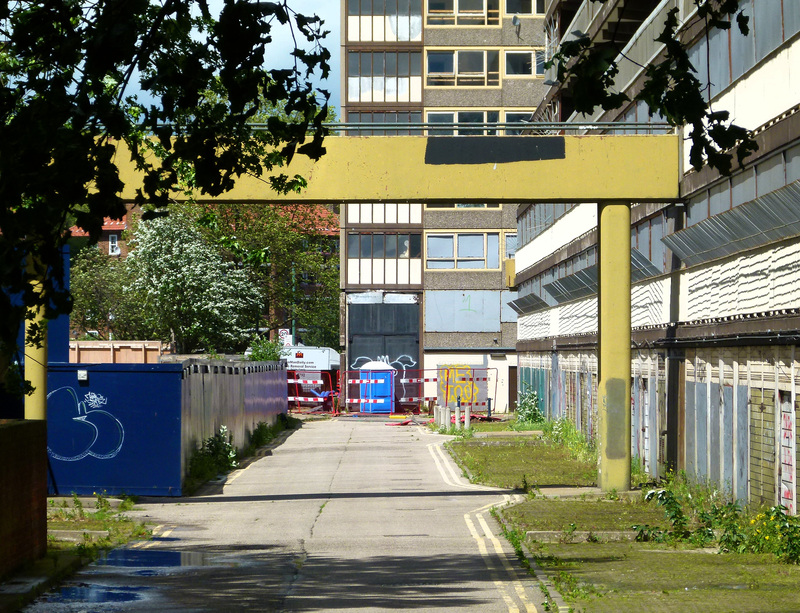 Thanks to its present state, the Heygate has proved a popular location for movie makers in recent years, with Southwark Council raking in a substantial £91,000 in filming fees since 2010. 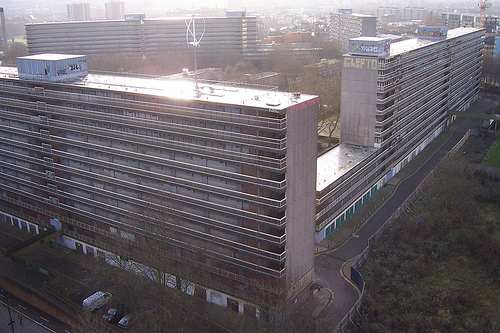 Two films to make substantial use of the estate are Harry Brown and Attack the Block. 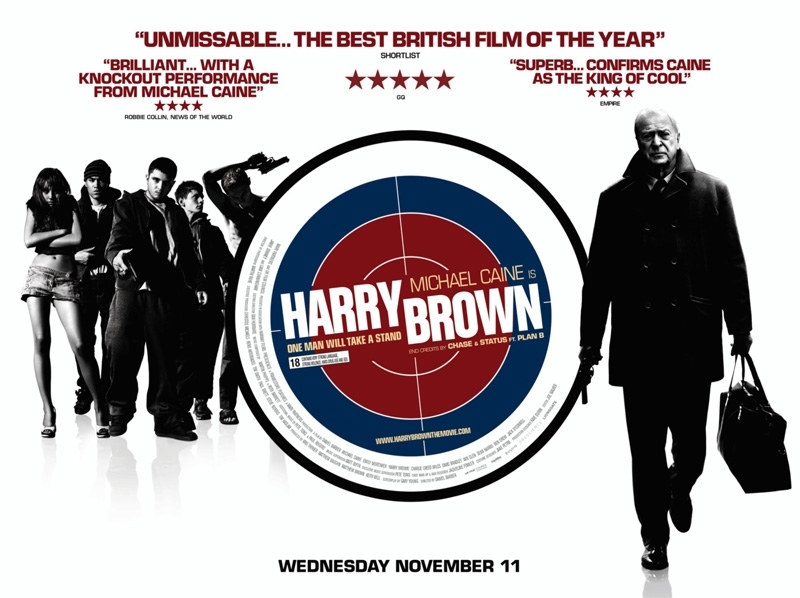 Released in 2009, Harry Brown stars Sir Michael Caine who, just like Sir Charles Chaplin a generation before, spent his tough working-class childhood in the Elephant and Castle area. 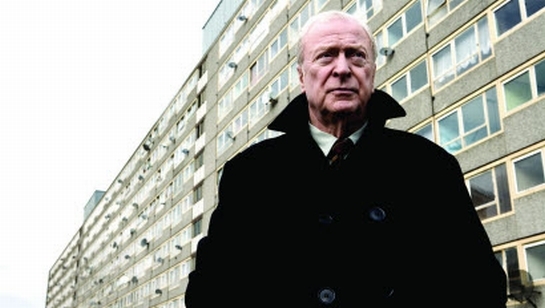 In Harry Brown, the popular actor plays a pensioner after whom the film is named; an ex-soldier living out his twilight years on a hellish council estate. One night, Harry has to rush to hospital, where his wife is dying. This, coupled with the murder of his friend who also resided on the estate, leads the pensioner to turn vigilante…a very grim film indeed. 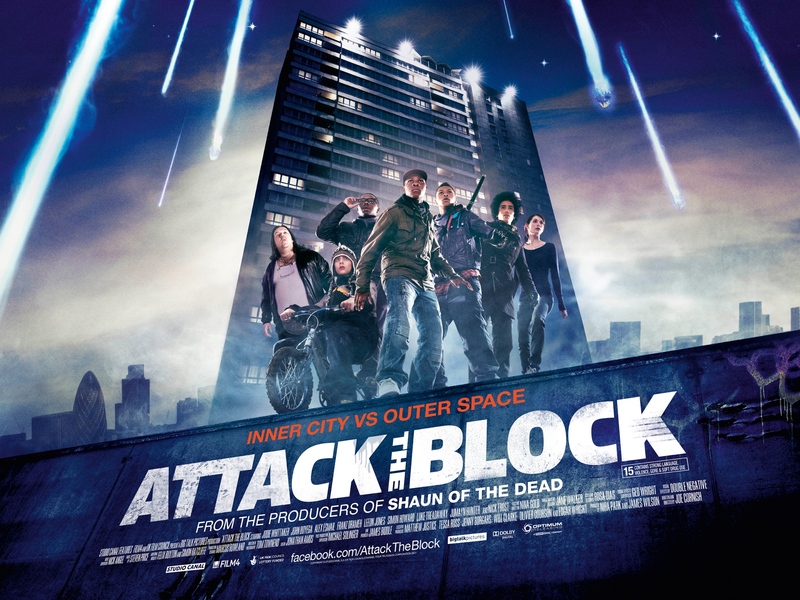 Being a comedy, Attack the Block is one of the more cheery films to emerge from the Heygate Estate. 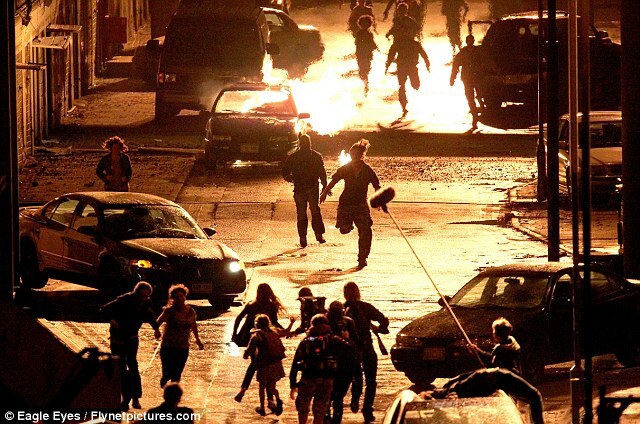 Released in 2011, this movie centres on a gang of youths… who find themselves having to defend their turf against an alien invasion! 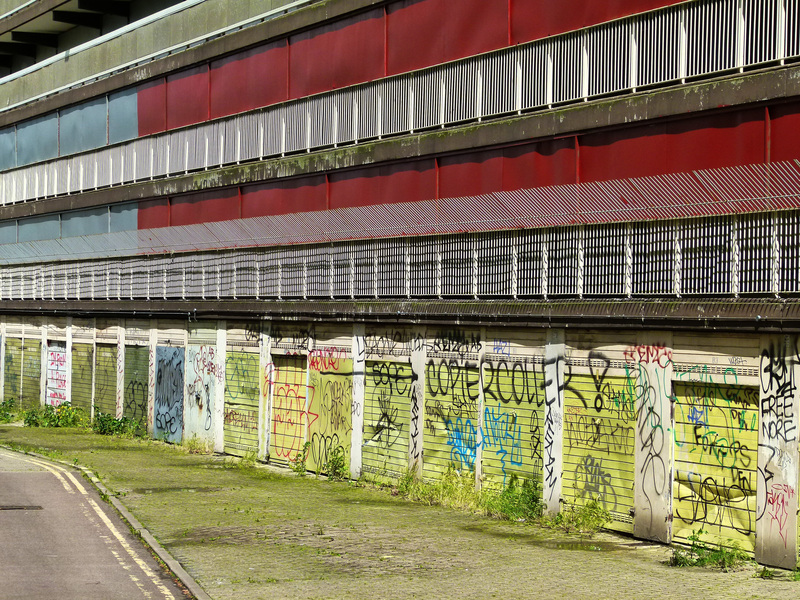 More recently, the Heygate has been used as a backdrop for World War Z; a horror film in which the world is gradually taken over by zombies. 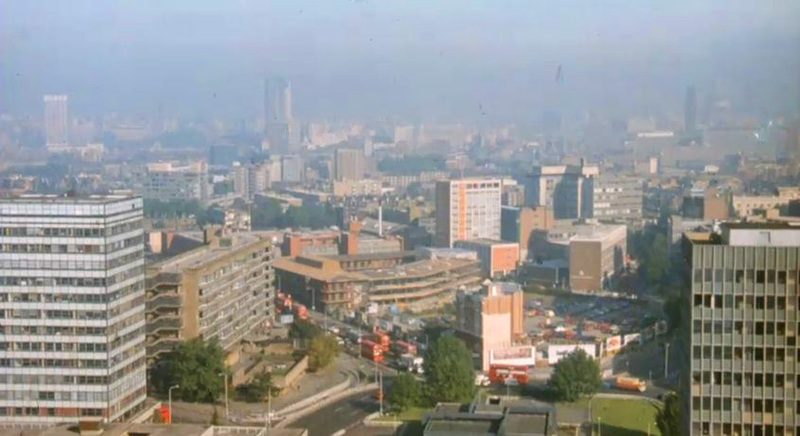 The Heygate is not the only the only area of the Elephant and Castle which has been used as a filming location. 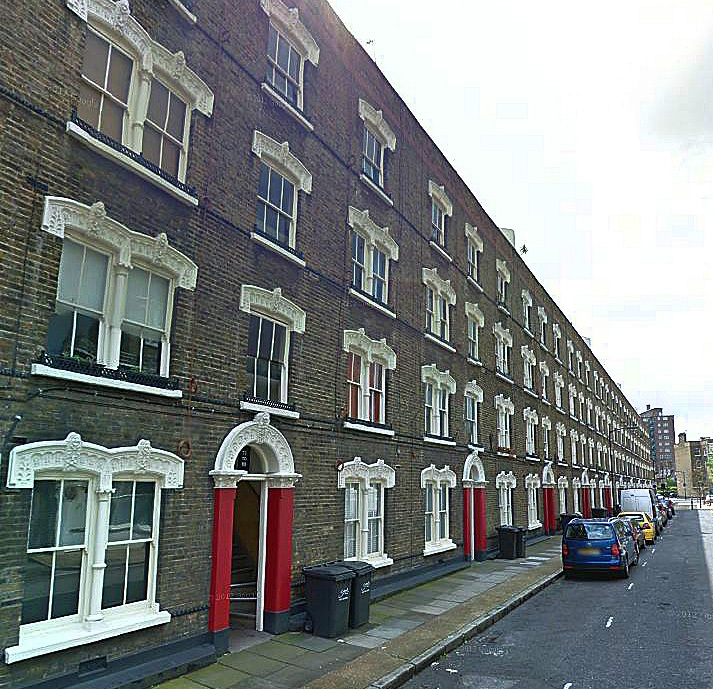 In the 2011 film, The King’s Speech, Iliffe Street, just south of the junction towards Kennington, was used to represent a road in fashionable West London. In 1968, the then brand new shopping centre featured in The Strange Affair which starred Michael York. In 1987’s gangster film, Empire State, the young protagonist and his moll live in Draper House, their balcony overlooking the Elephant’s large twin roundabouts. Looking out over the Elephant… screen shot from the 1987 film, ‘Empire State’. In 1982, the Elephant loaned its streets to the music industry when Brook Drive– which lies just west of the junction behind the Metropolitan Tabernacle, was used to film the video to the much-loved hit, Come on Eileen by Dexy’s Midnight Runners. In the past year, I have had two fares to Brook Drive and, in both cases, each of the passengers stated how chuffed they were to live on the same street where this hit, which seems to be played at every single wedding reception, found a home for its video! 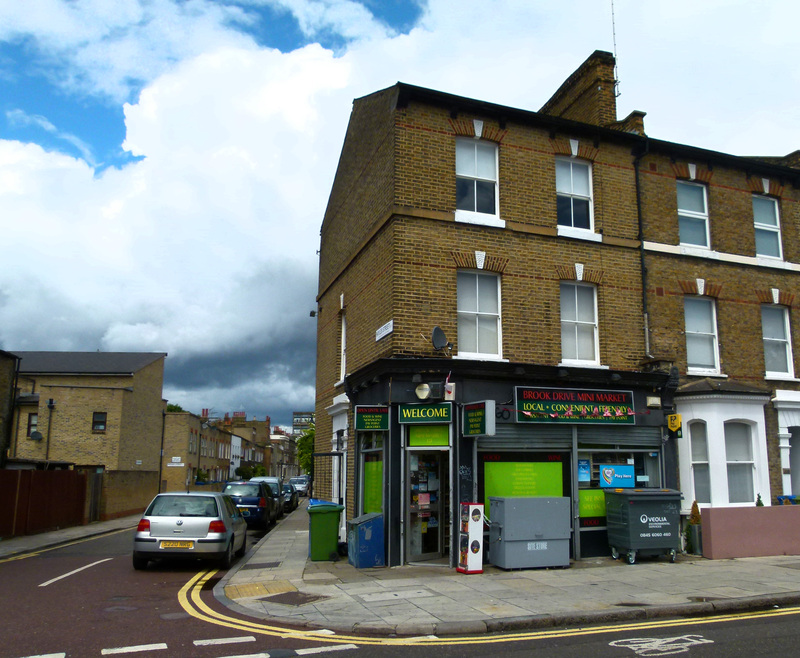 Brook Drive, junction with Hayles Street where the famous music video was filmed. Also in 1982, Dexys Midnight Runners released The Celtic Soul Brothers which was filmed on the other side of the Thames at the Crown Pub in Cricklewood- please click here to read more). 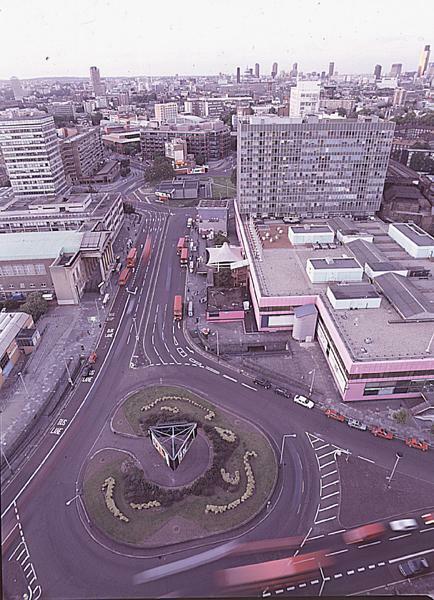 Today, the Elephant and Castle is undergoing its biggest change since WWII. As part of a £1.5 billion scheme, the 1960s shopping centre is due to be demolished and replaced with a pedestrianized market square and green open spaces. Overall, the change at the Elephant is estimated to take some 15 years. 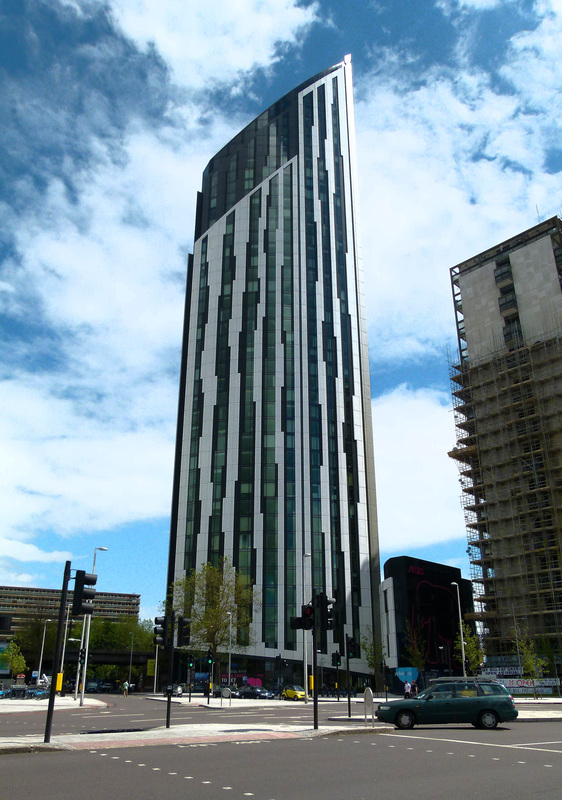 At present, the most prominent sign of this slow evolution is the Strata Building; a new tower which replaced Castle House and has been nicknamed by some Londoners as the ‘Lipstick’ building. 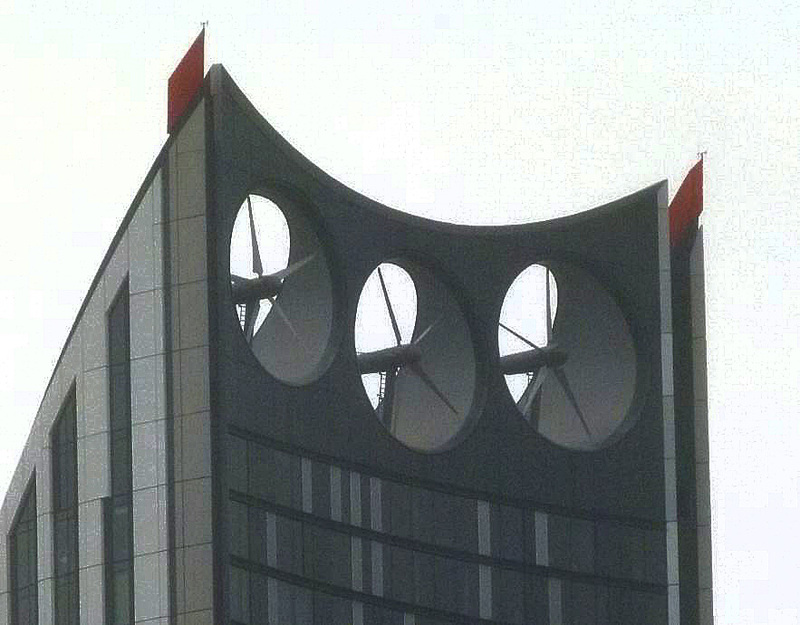 The Strata contains 310 luxury housing units, retail space at ground level and, most famously, three wind-turbines on its roof which are used for powering a small percentage of the tower’s utilities. 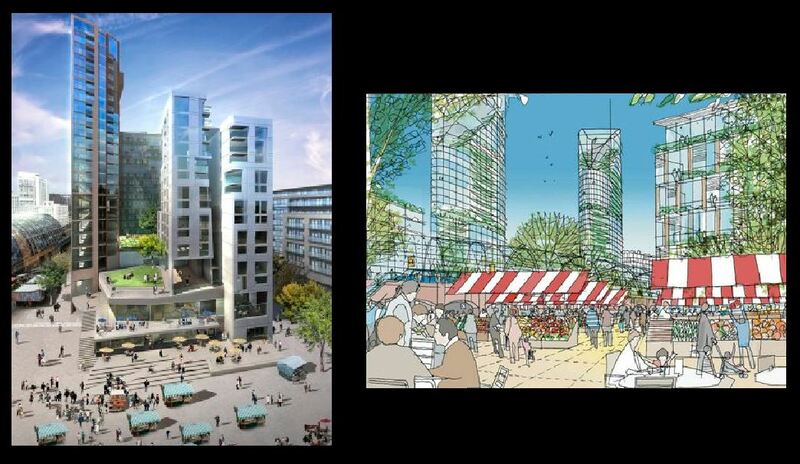 Wether of not these new developments will last longer than their 1960s predecessors remains to be seen… however, one thing is for sure- they are merely the next stage in the long and varied history of the Elephant and Castle. Posted in: Legendary Londoners, London History, London Music, London on Film, Roads of Renown	| Tagged: 1960s Architecture, Attack the Block, Dexys Midnight Runners, Elephant and Castle, Harry Brown, Heygate Estate, Jodie Whittaker, London, London film location, London Taxi, Sir Michael Caine, Strata Building, The Blitz, The Faraday Memorial, Where was Come on Eileen filmed?